Philippines was one of the six countries who signed the MEFIN Declaration of May 2013 (also known as Cebu Declaration) and signified support to the promotion of inclusive insurance as a strategy for poverty reduction in the region. In January 2016, Philippines renewed its commitment to the MEFIN Network which was then formalized as a regional platform for peer-to-peer exchange of knowledge and experiences in inclusive insurance. The Insurance Commission is the insurance regulator of the Philippines. An agency under the Department of Finance, the Commission supervises and regulates the operations of insurance and reinsurance corporations. In 2015, it was given authority to supervise and regulate pre-need companies. During the same year, the supervision and regulation of Health Management Organizations was also transferred to the Commission from the Department of Health. One of the recent milestones of the Philippine insurance industry was the signing of Republic Act No. 10607 President Benigno S. Aquino III last August 15, 2013. It amended the 38-year old Presidential Decree No. 612, otherwise known as “The Insurance Code.” An increase in the paid-up capital requirements for both life and non-life insurance companies was introduced in the amended Insurance Code to strengthen the country's insurance sector. 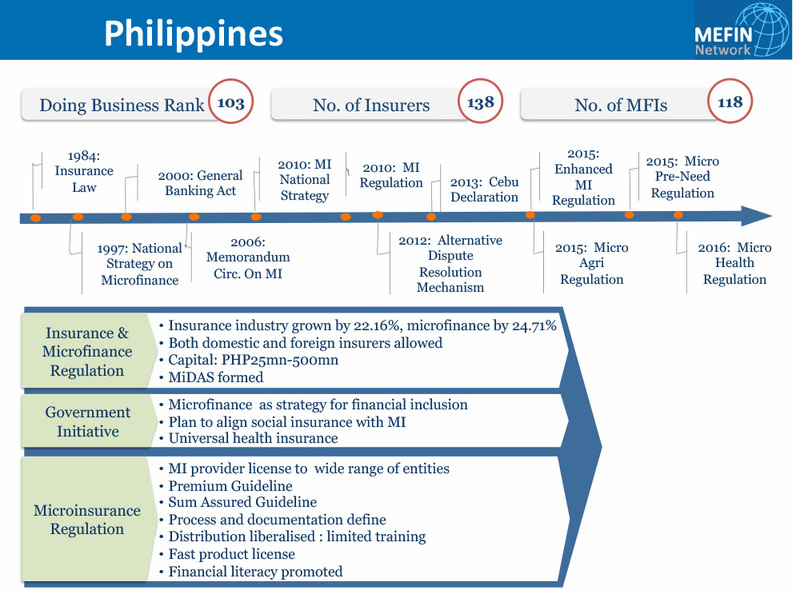 The Philippines is a pioneer country in microinsurance. The Philippines is home to an estimated 104,280,890 people with diverse language, religion, and ethnicity. Located in the western Pacific Ocean, it is composed of 7,107 islands grouped into three geographical areas: Luzon, Visayas and Mindanao. Located on the Pacific Ring of Fire and close to the equator, the Philippines is prone to earthquakes and typhoons, but endowed also with abundant natural resources and some of the world’s greatest biodiversity. It has an area of approximately 300,000 square kilometers and a population of more than 100 million making it the 12th most populated country in the world. Philippines Gini ratio, the coefficient that measures inequality among income distribution, lies at 34.0 and the HDI at 0.668.